Thanks so much for taking time to play along during this very busy time of year! We had many beautiful entries. 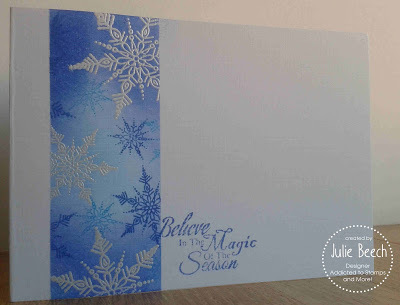 Your beautiful mix of stamped and embossed snowflakes really pop against the beautiful sponged background Julie. 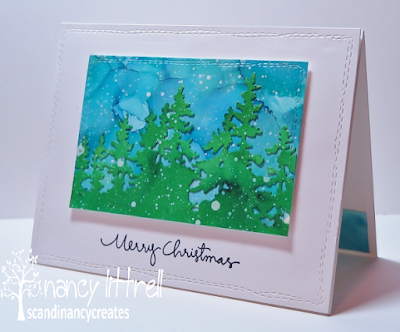 Love the variations of blues to create lots of depth in a one layer card. Amazing design! January's challenge starts in a few days. See you on January 1st! We're over half way through December, so just a reminder of our challenge this month is Sponging. We are so happy with all the fantastic entries so far --- thanks to all that have played along, especially during this busy time of year! Here's links to some sponging videos if you're interested. Basic Sponging Techniques by Dawn (3:04). 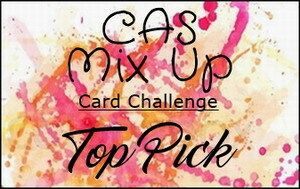 Please enter only Clean and Simple Mixed Media cards. More samples from our Design Team. 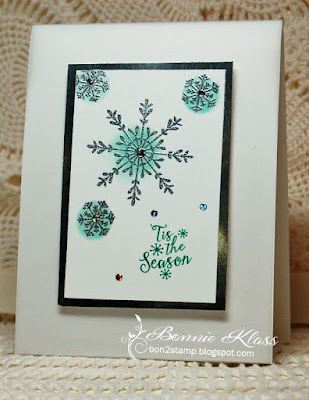 Using stamping, sponging (both regular and faux mother of pearl), liquid paint, ribbon, and die-cutting. 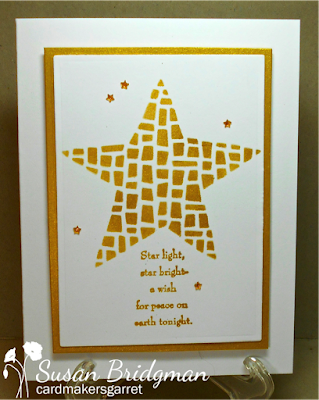 Using Stamping, Sponging through layered Stencils, Clear Wink of Stella Glitter Brush, Layered Die Cuts. The challenge is open until the 24th. Come play along! 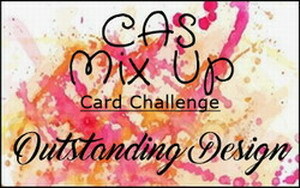 Welcome to December's Challenge at CAS Mix Up! We had lots of fantastic entries into last month's Masking challenge. Congrats to Trina who was our Pick of the Month for November! 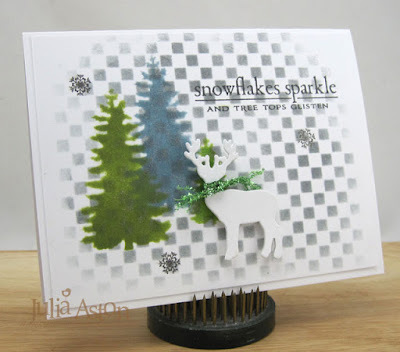 Click HERE to see Trina's card along with some of the Outstanding Designs using Masking. 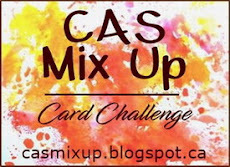 To see a close-up of all the beautiful card entries for November , check out CAS Mix Up's November Challenge Pinterest Board by clicking HERE. 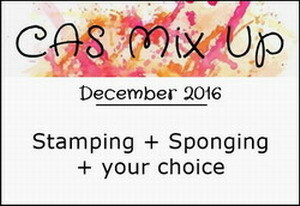 This month we want you to use sponging on your card. 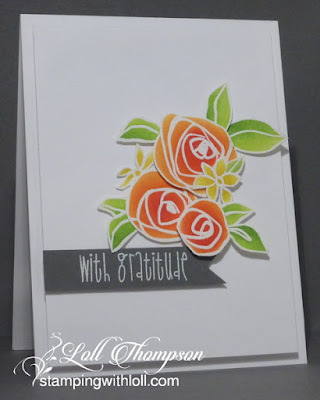 Make sure to include some stamping (a little or a lot), sponging, and then pick something from the "Your Choice" list in the right sidebar to add in. There are lots of ways sponging can add colour, texture, and dimension. 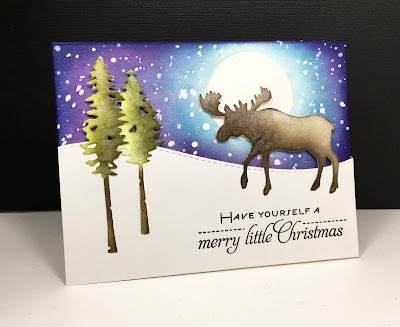 Show us your favourite way to add sponging to a card, or learn something new by trying a new sponging technique. 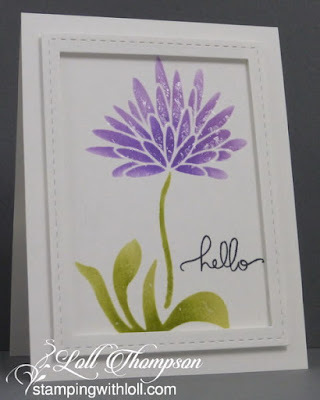 We are so excited to have Maura (beesmom at SCS) as our Guest Designer this month. 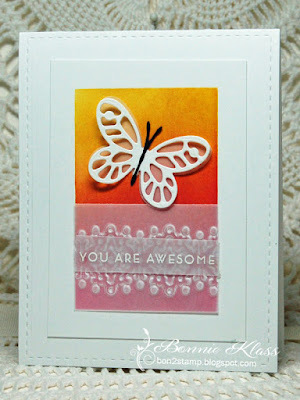 She made this gorgeous card that was the winner of October's Ghosting Challenge. 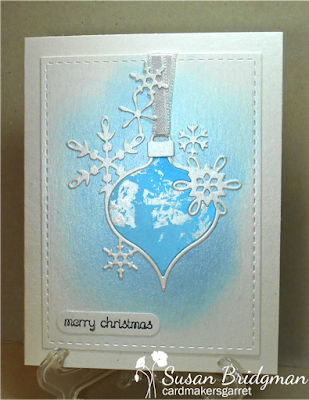 Using Stamping, Sponging, Masking, Perfect Pearls, Heat Embossing, Dry Embossing, Die Cuts and Vellum. Using Stamping, sponging, water and acrylic paint splatter. The challenge is open until Dec. 24th. Come join the fun!